Out of the recent tragic California wildfires I came across a heartwarming story that plays directly to the companies I’d like to take a look at today. Maybe you saw the story as well. A woman living in Paradise, CA, a town almost completely destroyed by the wildfires, owned two dogs. The dogs lived mainly outdoors, and when the time came to evacuate, the woman called for but could not find her pets. Though she stayed beyond the recommended evacuation time to search for the dogs, risking her own life, she could not recover them before evacuating. Happily an animal rescue volunteer who was allowed into the area after the fires left food and water on the property where the dogs lived and, after returning weeks later the owner found her dogs safe and sound. The heartwarming story, featured on national news networks, rekindled my interest in companies that cater to the pets we humans care about so deeply. There are two major sectors these companies serve, so let’s take a look at both of them before getting to the company’s themselves. The first, as I mentioned above, is the pet market. The second sector, concerned with animal health, is the livestock sector. Both are growing steadily. Using figures from Euromonitor International and the U.S. Pet Market Outlook by Packaged Facts, we can conservatively calculate global pet spending at over $150 billion in 2017. Spending on pets in the United States alone was over $86 billion in 2017. Global sales of pet products and services grew 14% from 2012-17. Several factors are contributing to this growth. First, the humanization of pets is a global phenomenon. More and more pets are treated as members of the family, and with that status comes spending on better nutrition and medical care. Baby Boomers are replacing their college aged children with pets and, Millenials are welcoming pets as companions and spending their rising wages on pet products. The second factor, closely tied to humanization, is the premiumization of pet care. Better health care doesn’t only mean more trips to the vet, but owners are spending increasingly on a variety of pharmaceutical products and medical procedures for their pets. The trend transfers to food as well where the health benefits of better eating are being bestowed upon both humans and pets. Euromonitor International points out that in 2017 premium dog and cat food made up more of the market than mid-price and economy food combined. On the other front, Livestock production continues to increase globally due to rising standards of living in developing countries and the overall increase in global population. While diets in places like the U.S. are shifting away from beef, they are increasingly turning to poultry as an alternative. From 1961 to 2015 meat production has grown globally between 400 and 500 percent, and the numbers are still climbing. With the U.N. reporting that rising demand for livestock is having negative environmental impacts, it logically follows that animal health, and the prevention of infectious and parasitic diseases in livestock, is taking on paramount importance. Combine this with a declining number of vets and Ph.D.’s in the animal health field, as reported by Forbes in an article titled The Future of Animal Health in August 2018, and you get a rising need for drugs and other treatment and prevention methods to address animal health. Zoetis is one of the largest animal pharmaceutical companies in the world. They provide medicines and vaccines, complemented by diagnostic products, genetic tests, biodevices and a range of services to both pets and livestock. The company is a buying opportunity now for two reasons. First, they completed the acquisition of Abaxis earlier this year. And second, sales of three of their major drugs, APOQUEL Simparica, and Stronghold Plus are accelerating, and they are receiving approval in several countries for new drugs coming to market. In July the company completed the acquisition of Abaxis. This gives Zoetis a leading position in the pet diagnostics business that directly complements their pet pharma business. They already possess the channels, with a direct presence in over 45 countries, and sales in over 100, to rapidly expand the Abaxis solution. Earnings have been aided by increasing sales of APOQUEL, a dermatology drug, and Simparica and Stronghold Plus, parasiticides for dogs and cats. In addition to the success of these drugs, Zoetis reported last quarter they had received approval for a new swine respiratory drug and a dog antiviral drug in Japan, a drug to fight respiratory disease in cattle in Australia, and an E. coli vaccine for chickens in Taiwan. Zoetis grew earnings 32% this year and has maintained profit margins of just over 20%. Profit margins have grown steadily upward since Q1 2016, when the profit margin stood at 7.83%. Zoetis splits its revenue almost equally between the U.S. and internationally. In its latest quarter $757 million came from the U.S. and $707 million from international sales. Freshpet is a direct play on the premium dog and cat food market. The company sells its farm to fridge all natural foods in over 19,000 retail stores across the U.S. They estimate their customer base at 1 million pet owners, leaving them plenty of room for growth in the U.S. market of over 80 million pet owners. And, in addition to brick-and-mortar sales, the company saw a doubling of its nascent e-commerce business. Freshpet has a very compelling story for social media messaging, playing both on the healthy pet food angle as well as an animal welfare campaign the company promotes by teaming with animal shelters. Freshpet has been in high growth mode since its IPO. It has averaged 31% growth the past several years and is projected to grow earnings 377% next year. As CEO Cyr said in their latest earnings call, the company is at a tipping point where it is both continuing to grow top line revenue but also realize scale manufacturing benefits. 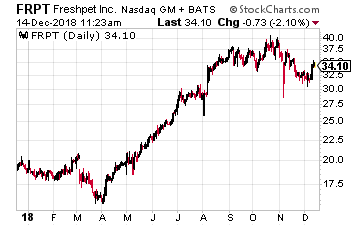 As the company transitions to profit, now is a good time to pick up shares of Freshpet. Finally, Trupanion provides insurance for dogs and cats. The company came public in 2014, and has averaged 34% earnings growth over that period and, now insures over a half million pets. 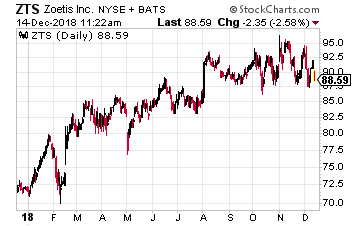 This stock is more for the contrarian part of your portfolio as shares have been battered pretty hard since August. I offer it as a bonus investment idea to the two more stable recommendations above. While selling insurance mainly through veterinarians, the company has begun to sell both direct-to-consumer and through employee benefit plans, a growing segment of the pet insurance market. This move to additional channels, on top of its veterinarian channel growth, is one reason I believe the company is a buy here. With location offerings rising 45% since the end of 2017, Trupanion insurance is now offered in over 3,000 veterinary hospitals. A big draw for the hospital acquisition and retention is the company’s proprietary software. As CEO Darryl Rawlings referred to it in the their recent conference call, “With our software, our promise is to pay veterinarians directly at the time of checkout within five minutes or less.” This could be a huge differentiator for the company’s growth. 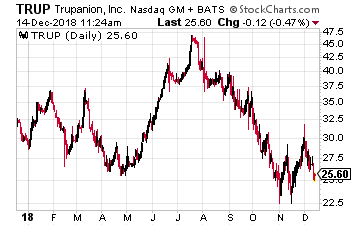 Trupanion is projected to become earnings positive next year, with 333% earnings growth. With 12 million new puppies visiting veterinarians each year, and 1 million of those being entered in practice management software, Trupanion has an established and large market to attack.